Clary encounters the dark side of New York City - and the dangers of forbidden love. This is a book that has been majorly hyped, and with the release of the book-to-film adaption just a couple of weeks ago, I'd be surprised if there is anyone in the world who hasn't heard of it. For a few months I was pretty intent on not reading the series because firstly I didn't want to be disappointed when they've been hyped so much and secondly I like to be different. Yes, I'm a book blogger but that doesn't necessarily mean I want to read what everyone else is reading! However, after months of torture persuasion from Lucy and Zoe, I caved in and bought the whole series. A risk, but the whole series was on sale for just £6.99 which is a saving of about £32 - who could say no?! If you've been reading this blog from the beginning, you'll know just by looking at the cover of this book that it's not something I would usually go for. The thing is, I have never seen a negative review of the series so I thought if everyone else likes it, chances are I will too. I'll admit, I did run into a few problems whilst reading the novel. The author didn't seem to stick to her plan. By that, I mean she would say something and then completely contradict it on the next page. For example, a few of the characters were at a party. She wrote that there wasn't a band there, and then on the next page she mentioned a band playing. Another example of this is when they were going to a hotel. Jace knew exactly where the hotel was, and then on the next page it said they had spent an hour looking for it. If you know exactly where a place is, surely you wouldn't spend so long looking for it? I know I'm being picky, but even debut authors make sure not to make mistakes like this, and Clare has written a lot of books in her time. Another (but the last) fault I found with the book was that occasionally the characters would act a little stupid. An example is when they were being chased somewhere (don't worry, that's not a spoiler) and when they were trying to escape they ran upstairs instead of downstairs. Hmm. The problems I have highlighted don't majorly affect the story, luckily. I know I was being picky, but when a book has been so hyped and when an author has written so many books, you don't really expect to see any basic problems at all. Now I'll get on to the positive things. OH. MY. GOD. This book...I LOVED IT SO MUCH. I'm not going to confer to the stereotype and say 'Omg this is the best book ever read it now k bye' because in all honesty, it isn't the best book ever. However, it was absolutely fantastic and I was completely blown away! I felt ALL THE FEELS. Heartbreak, empathy, urgency, horror, compassion. As soon as I finished the book, I went straight to Twitter and it turned out me and Hawwa had finished the book at exactly the same time! Caps lock ensued. Here is just a small preview of what you may have missed, and whilst I'm on the subject, I apologise for clogging up your Twitter feeds last night. It was, erm, a book emergency. Anyway. The world that Clare has built is beautifully detailed and I really felt like I was there. The book took me a while to get in to, but that seems to happen with every book I read these days so I stuck with it and I am so glad I did! The characters were all so diverse and it added even more originality. Obviously I have fallen in love with the book and I really hope the other books in the series will be just as good, if not even better. The concept is brilliant - people who can hunt demons. Shadowhunters. Fighting to the death. I just loved all of it! 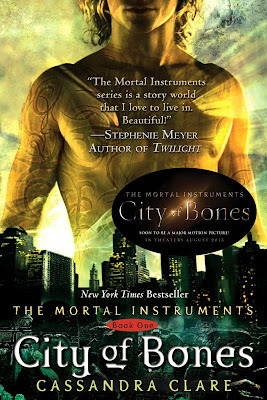 The main love interest Jace was full of witty comebacks and hilarious one-liners. All the banter had me laughing out loud! I loved the fact that on the surface, he didn't seem to care what anyone thought but you could tell that inside he was quite vulnerable. Clary was awesome, too! She wasn't afraid of much and she coped with her Mother's death well. She fully immersed herself in the world of Shadowhunters and she was so headstrong and determined. Simon, her best friend and part of a love triangle, kind of annoyed me a bit at the beginning but I grew to like him as the book went on. And then the twist near the end of the book. WHAT?! I honestly did not see that coming at all! Woaaahh. That has to have been the best plot twist ever. People who have already read the book will know exactly what I'm talking about here. asiugdsogqwohqeobaohPHQPHJPp Ok you know how much I adore this series, I'm utterly obsessed. I'm so glad you liked it! Having read all of Cassie's books, let me warn you that you will never be the same again. The heartbreak, pain and feels overload do not stop. Cassie will be the death of me. Great Review. Being chased upstairs? I thought that was a bit strange...but, were the trying to get killed? Haha, thanks for throwing in my Tweet! I completely forgot I said that! I completely agree with everything you said, I also had my problems with the book but I still really liked it! My feelings towards the end..woah!